Brendan Walsh's recent post on the Irish economy blog is also worth looking at in this context. He considers the demographic outlook under the assumption of zero migration. 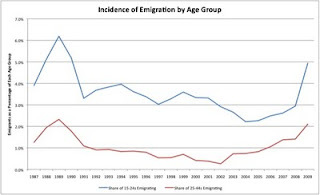 Emigration is the great safety valve of the Irish establishment. As anger rose over taxation levels in the late 70s and early 80s, the angriest people simply left the country. Others were encouraged to leave by the then Government. The same is happening now. 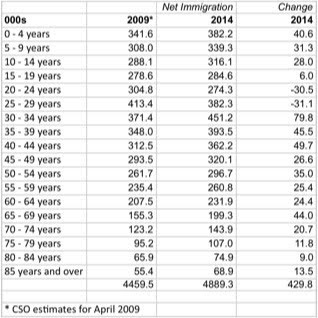 The current Government seems to have an unofficial policy of ensuring net emigration of 150,000-200,00. This will be just enough to stop rioting and the other normal reactions the second Fianna Fail economic melt-down in my lifetime. Think of the awful impact on one's pension prospects!